Mayura Park is what remains of the once existing Karang Asem kingdom of Bali. 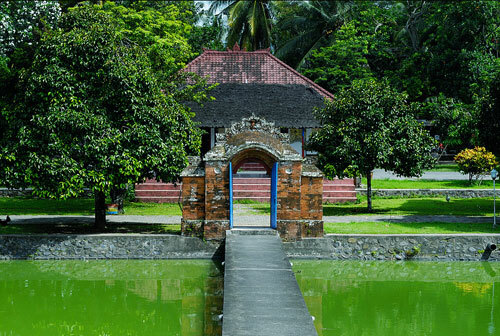 In the middle of a large pond is a structure called Balai Kambang, which at the time functioned as a legal court of justice as well as a hall for important meetings. Curiously, its architecture shows both Hindu as well as Islamic influences, whereas around the place statues made of stone are found in a Moslem hajji form. Mayura and Bale Kambang, had built on 1743 by Balinese Hindu’s Dynasty; Anak Agung Gede Karangasem. It’s now become a recreational park when seasonally used for Music Festivals. You ought to write a guide on this. I’d be considered a buyer right away. You’re a one of a kind blogger in this field. Continue the work. It’ll pay off.